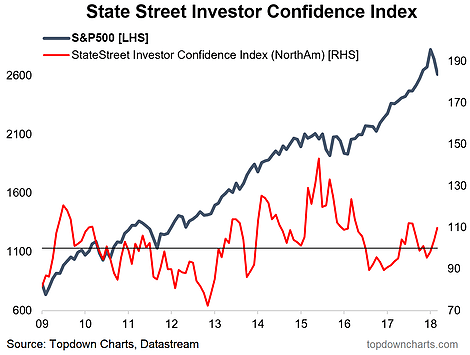 The March data for the State Street Investor Confidence was released this week and showed some very interesting patterns across institutional investors. The global index was up +4.7pts to 111.9 (contrasts to a reading of 95.7 back in December 2017), Across the regions, the North America index was up the most +5.8pts to 109.8, followed by Europe up 1.6pts to 102.1 and Asia up +1.3pts to 109.6. At a high level, basically what it appears to show is global institutional investors are “buying the dip”, or at least actively rebalancing into equities. "It measures investor confidence or risk appetite quantitatively by analyzing the actual buying and selling patterns of institutional investors. The index assigns a precise meaning to changes in investor risk appetite: the greater the percentage allocation to equities, the higher risk appetite or confidence. A reading of 100 is neutral; it is the level at which investors are neither increasing nor decreasing their long-term allocations to risky assets. The index differs from survey-based measures in that it is based on the actual trades, as opposed to opinions, of institutional investors." -Global institutional investors appear to be buying the dip. -Institutional investor confidence improved across regions, particularly in Asia and North America. 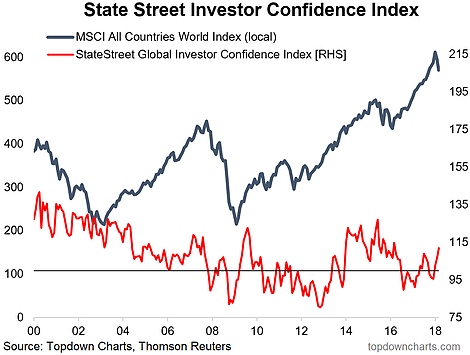 Global Institutional Investor Confidence Index: The latest reading of the global institutional investor confidence index reached the highest level since March 2016. My first impression of this chart (shows the indicator vs global equities) is that I can't help but think of the phrase "buy the dip" (which sometimes includes an F in there). So the main interpretation would be that institutional investors are buying the dip, or certainly at least actively rebalancing into equities as the correction provides a reset of sorts. 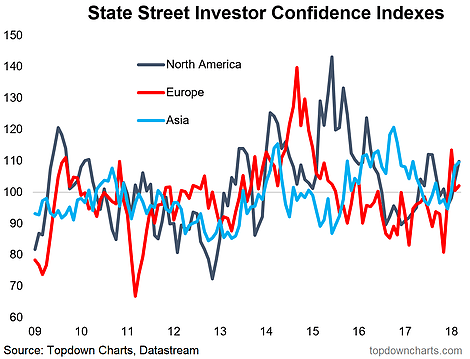 Institutional Investor Confidence - Regional: Looking across the regional indexes, there appears to be a fairly synchronous uptick in allocations to risky assets, but most notably in Asia and North America. It seems to show that investors are largely looking through the noise of the headlines and taking advantage of the heightened market volatility to build exposure (on the belief that the market/business cycle is not over yet). Indeed, while the US equity market is expensive, there are still pockets of value/relative value across countries. North America Investor Confidence Index: Honing in on the North America index, the March/Feb readings stand in contrast to what institutional investors were doing during the 2010 and 2011 corrections, and more like the increased buying around the 2015/16 corrections. So it raises the question, as to whether North American institutional investors will be the ones to capitulate next (the bearish case), or whether this is the smart money which is taking the opportunity to build exposure in expectations of further upside (the bullish case). By way of contrast, as I mentioned last week, the Euphoriameter is showing broader investor sentiment pulling back.